It seems months ago now, but it all started over a pint in our local pub in Sheffield. A friend and I were discussing how we could both get more motivated. My friend already had experience in website design and we were each operating small websites for our Sheffield based businesses. The initial idea was not to open another company, but to meet once a week to bounce ideas off each other and generally keep each other motivated. At that point I was relatively new to web design, struggling to get to grips with Dreamweaver. Myself always working in 'design view', trying to do as little with that coding window as possible! And my friend the opposite, solely working from the ground up with just code. These meetings proved very beneficial, allowing us to set each other targets and goals for the coming week , honest opinions on bad ideas and tips or tricks both of us had picked up. Share your goals with a friend or family member. Set common time limits and regularly keep one another updated on your progress. Set a regular meeting, say once a week and run through each others' goals. These two pointers will ensure motivation levels are high and remain so. To bring this idea into fruition we set about breaking down the big picture into sizeable chunks and commenced our assigned tasks. When starting a new venture like this it is important to have clear goals about the future. Try and visualise who your customers will be and what services they'll require. From these thoughts, design a company model with the needs of your potential clients in mind. In our case, our potential customers would be looking for an affordable website made by highly skilled website designers. Once we had settled on the name Web Branding, the first thing to check was whether the web address was available. Fortunately, the domain name that we wanted was available. As a Sheffield based web design company, it seemed unnecessary to pay for a .com domain when the focus of our work would be within the UK. 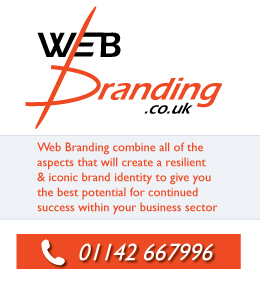 www.webbranding.co.uk was born! Reasearch shows that it's much harder to get decent search ranking on Google from a .com domain if you're based in the UK. A .co.uk address is much more preferable for UK companies. Also make sure your server is based in the country that you are working from. With a domain name purchased, everything seems a little more concrete, the bright lights of Web Branding may soon be shining out from our website. We had our shop but now to fill it.The first stop was designing logos and deciding on the image that would best represent us as a web design company and boost our internet marketing. After numerous sketches and ideas we chose our favourite. With a Logo decided on, our progress took a natural progression onto colour palettes, web page creation and designing business stationery. All these factors should complement one another and also more importantly, should share similar design traits. Consistent and uniform design in all aspects of company image is the key to a successful brand. With this idea in mind we came up with a company slogan, 'Designing Brand Identity', this suited how we wanted Web Branding to be seen by our customers. Don't be daunted by the amount of work ahead, break it down into sizable chunks. Once you have a name, check to see if your domain is available. Create a Brand by combining all design elements with a common theme. How much should we charge? What timescale are we looking at for website construction? How can we provide the most affordable website design? How do we get noticed online? This brings me nicely onto the subject of SEO which stands for Search Engine Optimisation. In our modern world the internet is becoming a more and more important business tool. In most cases today peoples' first impression of a company will be by checking out their website. As it stands at the moment, 80% of all internet traffic stems from Search Engines. A good first impression is vital but that impression is somewhat lost if no one is able to find your well designed web page creation! An increase in website traffic is needed, this would no doubt benefit any company just as your shop would benefit from more visitors through the door. My friend had been reading up on Search Engine Optimisation and establishing how it could work for us to help boost our internet marketing. David Viney's book 'Get to the Top on Google' was an invaluable source of information, and helped open our eyes to the potential of SEO for Web Branding. If we were to compete with large and well established web design companies we'd need to make the most out of Search Engine Optimisation. For anyone interested in this topic I would definitely advise you to check out David Viney's Website or buy his book. I won't go into too much detail regarding SEO as it's a vast topic and is constantly changing. Our plan was once again to get into our potential customers' minds. What would they be searching for online if they wanted to find a web design company or even just someone to provide designs for business cards? A list of commonly used search phrases such as: web design company, web design, affordable website design, website design Sheffield, and so on were compiled. These phrases were keyed into an excel spreadsheet and then analysed. By analysing the amount of monthly searches, the raw competition and those websites who were directly competing with us (ie. Websites which included that certain phrase), we were then able to gauge the Keyword Opportunity Index. This enabled us to handpick the most beneficial phrases to liberally sprinkle throughout our website, title bars, headers and content. This should..so the theory goes, propel us up the Google listing mountain and have Web Branding appear high in the search when our next customer types in website design packages or a similar phrase. It does require a lot of work, and patience is key, but putting in the groundwork in the early stages of a new business development with pay tenfold further down the road. At this stage we had a decent list of services that we could provide and the list was ever growing. It wasn't just web design we could offer but web hosting, company logos designed, business stationery, designing brand identity and now, Search Engine Optimisation. The Web Branding initial idea was now blooming and we nearly had a website ready thanks to our programmer, designer & technical consultant all working together. Creating a strong foundation for your business in the early stages will help promote growth. After months of hard work we have taken that initial idea from the pub in Sheffield and run with it. Ideas and plans always change but it's important to have a plan in the first place. Throughout the building of Web Branding, all our team have been constantly adding to the business plan. As the business plan slowly evolved, it was, and still is a necessary and effective tool. As mentioned in the first section, it is important to keep track of your goals and targets and that the business plan includes all of these. This is still a good source of information for all of our weekly meetings - although now we have progressed from Cash Wednesdays to SEO Sundays! With our web design company ready to go live, we could now focus on a previous topic discussed; getting noticed online. This is an ever more important issue and in the same vein as talking about a business plan, we understood the need to get the Web Branding name out there. Social media is all the rage at the moment and a newly formed business would be daft not to take advantage of this new.. well newish phenomena. We have our blog at blogger.com, a twitter page and of course a facebook group. Within the last few months, for the first time ever a website has had more hits than Google, that site being the nearly household name of Facebook. The champagne must have been flowing at their end of month meeting! It is so important these days when starting a new company to really look at the future of the internet and work out how your business can benefit from it. I assure you it can whatever your trade. I hope this article has helped and informed at some level. I have only touched on certain topics of the development of our new web design company because even at this early stage in Web Branding a lot of ground has been covered. The ongoing challenge is to keep finding new customers (and we know there's plenty out there!) and continue to provide them with the best website designs available while holding our slogan of 'Designing Brand Identity' at the forefront of our minds. The age of website design has by no means just begun but the need for web page creation is surely greater than it's ever been. As more and more of us rely on the internet as our first port of call, the shops of the future are definitely not bricks and mortar. For anyone thinking about starting your own business, don't give it a second thought, get pro-active and do something about it. We created a web design company but this article covers many aspects useful for a new business. The challenges are the exciting and exhilarating part of it, many jobs just don't tick those boxes, unless you want to be the ones moaning about their 9-5, it's your chance to do something about it. NB. You shouldn't be afraid of hard work!! I need to send it off to the printers with correct Registration Marks. This technique can also be used for designs for business cards or any other business stationery. 1) The size of an A4 sheet is 210mm x 297mm. Upon selecting New document add 3mm on the top, bottom, left and right of the document. This will create an excess border of 3mm to work from so when your letter head goes to the printers no white gaps are left near the edges. 2) Now for the margins.Turn on rulers, and then drag from the edge and drag guides to line up with the black edge of the artboard. Click on each guide one at a time and press enter. A move window will pop up, instruct each line to move inwards by 5mm. ie. Top line moves vertical -5mm, the right guide moves -5mm horizontal..and so on until you’ve created 5mm spaced gap inside your artboard. 3)Now draw a rectangle around your artboard. This will be the size of our A4 sheet, 210mm x 297mm. No-Fill just a thin border. 4) Select the rectangle, now to the menu > Effect > Crop Marks. Four new lines should appear at the corner of the page. If not make sure the A4 sized rectangle is definitely selected and try Crop Marks again. 5) We’re now ready to turn this into a Pdf ready to send to the printers. File > Save As, and select pdf and name accordingly. 6) Upon clicking Save, the Save Adobe Pdf option screen will appear. On the drop down Adobe preset select [PDF /X-1a:2001] this is a common standard most printers are happy to work with. 7) Click on ‘Marks and Bleeds’ down the left of the window and click box the ‘All Printer’s Marks’..just below this also click the ‘Use Document Bleed Settings’ This will use the 3mm bleed gap we set up on making the new document. 9) Now to find our saved PDF and open it. 10) The PDF will now show Printing Registration marks around the edge. These will not print out, test this by selecting print in Adobe Acrobat. The marks around the edge are faded and won’t print. This PDF is now ready to send to the printers or a professional document to send to your clients. I hope this blog helps.. Web Branding comprises a small and busy team, we work hard and enjoy what we do. This helps us to provide you with the best possible service for your money. Wherever possible we will arrange for a face to face consultation as we believe that this is the best way to ensure that your new website is a success. If you’re looking for a conscientious and enthusiastic team to work with your business, look no further! Let us Brand your business and boost your online presence. Web branding will provide you with the ideal webpage to increase traffic to your site and improve customer confidence. Our Search Engine Optimisation service will make sure you get noticed by everyday search engines and improve your online sales. Our best website designs are just the beginning, we not only provide a full internet startup package but can also help create, brand & re-launch your offline presence. Company Logos that inspire confidence, sleek business cards and letterhead designs are just part of our wide business stationary design service. We uniquely combine all of the services required to brand or rebrand your company, bringing you up to speed and in contention with the technological age. With all services covered from web design, logo design and business stationery, why look elsewhere? Our small and skilled team means that you get the lowest prices with a personal touch. Through face to face consultations, telephone conversations and online information we can learn a sufficient amount about you and your business. We will then show you the best way to represent your business online.